There is no test for RLS, but physicians have four basic criteria with which to form a diagnosis. Some medical conditions are tough to diagnose. One of them is Restless Leg Syndrome (RLS), according to Jacksonville vein specialist Dr. James St. George, founder of the St. Johns Vein Center. RLS is a neurological disorder marked by a throbbing, pulling or creeping sensation in the legs and an uncontrollable urge to move them. Unfortunately, there is no specific test. However, RLS does involve four key signs that physicians use to reach a proper diagnosis. Vein issues within the legs are a very frequent cause of RLS. 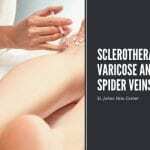 Treatment of the leg veins usually eliminates the RLS; however, not all RLS is caused by vein disease. Patients who suspect they may have RLS should thoroughly describe all symptoms to their doctor, including the frequency, duration and intensity. Other clues may include disruptions in sleep patterns, an increased tendency toward daytime sleep, and trouble concentrating on or completing daily activities. A family history of RLS may also factor into a diagnosis. Your vein specialist may order laboratory tests to rule out other conditions that have similar symptoms or are associated with RLS. For instance, blood tests can identify iron and vitamin deficiencies. And certain sleep studies can help identify other potential causes of sleep disruption such as sleep apnea. These findings may help avoid a wrong diagnosis or impact the management of your RLS. An estimated 10 percent of the US population may have Restless Leg Syndrome. If you are experiencing RLS-like symptoms, contact the St. Johns Vein Center at 877-640-VEIN (8346) or via our convenient online form.